The main news this morning revolves around Arsene's post match press conference yesterday. 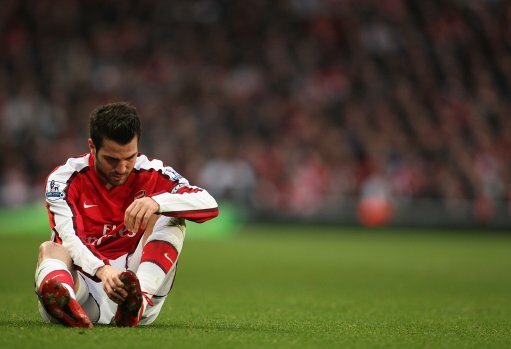 Many of the papers have Arsene's quotes, telling them the club won't be selling Cesc Fabregas to Barcelona. "There was a lot of unneeded talk. It is not pleasant to read that every day. Now, the story has to stop. "Cesc is our captain, he is so important to us and we want to keep him, that is why we were not listening to any offers. "It was not a problem of money, just the desire to keep him at the club. "We can only influence our own behaviour, and I believe things have now gone straight again with Sandro Rosell. "We always had a consistent attitude and were always reluctant to talk about Cesc's departure. "It is very important we give the impression that just because somebody wants a player from us, we do not just give in. "We have shown our love and care for Cesc since the start. "I believe Cesc loves the club, has shown his attachment to the club many times and I am very confident the story will end there. "We want Cesc to be part of our club next year, and that is it." I'm afraid to say it hasn't stopped yet. The Daily Star Sunday have an interview with Carles Puyol. "Cesc is a really nice guy and desperate to become a Barcelona player. "But he is not the sort of player to be ruthless and start using the media to get him the move that he wants. "There are many players who would try all sorts of tricks to make it impossible to ever play for Arsenal again but that is not his style. "I think Arsenal need to respect his class and show the same class by giving the guy who has given so much to them the move that he and his family want. "He isn't just being deprived of moving to the best club in the world. "More importantly, he is being deprived of coming home. "He has tried everything to win trophies at Arsenal and when he sees the success so many of his Spanish team-mates are having at Barcelona, it's only natural that he should want to be a part of that." Now I'm sorry Señor Puyol, you are the one who lacks class. First you pull a Barcelona shirt onto our captain, then you publicly tap him up - not once but twice and now this nonsense. Arsene has said what he want to say. Cesc is staying and that should be the end of the matter. "I wouldn't like to be in his position because he is from there and he loves Arsenal. "I don't know what to say about this, because I don't want to talk for him. "But as an Arsenal fan, for me, I want him to stay at Arsenal, but I would also understand if he goes back home." An aside from Arsene's press conference. He said Almunia missed the game through illness and asked if interested in signing Mark Schwarzer said: "not really". He also said he expected William Gallas - linked with a move to Panathinaikos again today by the People - and Mikael Silvestre to leave. Other items not related to Cesc to Barcelona. Robin Van Persie talks about how Holland played at the World Cup in the Mail on Sunday. Sol Campbell - who got married yesterday - is linked with a move to Newcastle by the People. Joe Cole could be heading to the north west and signing for Liverpool if the People and News of the World are to be believed. We've put a £14m bid in for Everton's Phil Jagielka according to the Sunday Mirror. The News of the World says we've been told to make a £10m offer for Connor Wickham if we are going to bid for the 17-year-old.